Puerto Rican cooking has a distinctive character all its own, with influences from both the Spanish settlers and African immigrants, as well as from the native Caribbean peoples. For the most part, Puerto Rican food is pretty healthy, featuring lots of delicious tropical fruits along with plentiful fresh seafood. As with any national or regional cuisine, however, there are a few nutritional pitfalls you'll need to watch out for. Perhaps the staple food of the Puerto Rican diet is something known as arroz con habichuelas, or good old rice and beans. While this dish is very low in saturated fat and cholesterol, it is pretty heavy on the carbohydrates. One cup of rice contains about 45 grams, or 15 percent of the recommended Daily Value of carbs, while the beans--typically red, pink or pinto beans--contain from 40 to 47 grams of carbs, or 13 percent to 16 percent of the Daily Value, or DV. Many of the vegetables used in Puerto Rican cooking are root crops, including potatoes and yucca, but the most popular vegetable is the plantain. Plantains are similar in appearance to the banana, but must be cooked in order to be eaten. 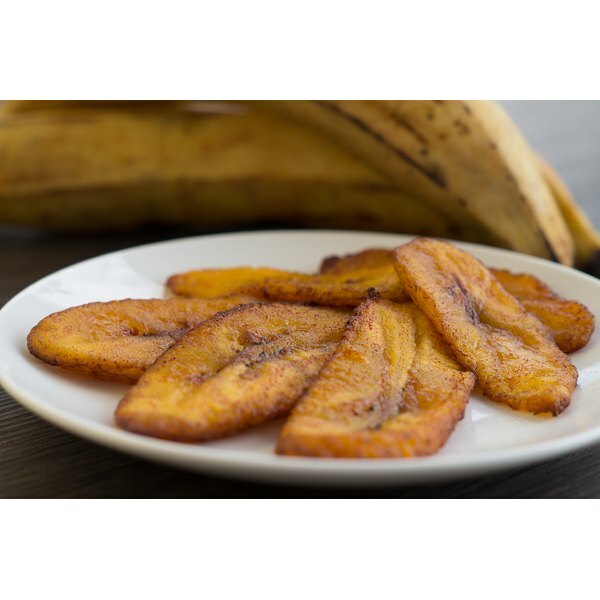 A typical serving of boiled, mashed plantain is high in vitamins A and C, equal to 36 percent of the DV. They are low in saturated fat and cholesterol, but they do contain 62 grams, or 21 percent of the DV, of carbohydrates. Puerto Rico is blessed with an abundance of tropical fruits, including the papaya, guava, passion fruit and mango, all of which are high in fiber and great sources of folic acid and vitamin C. Puerto Rico's leading fruit crop is the pineapple. One 3/4" thick slice, 3 1/2" in diameter, has a whopping 40.2 mg or 67 percent of the DV, of vitamin C and 0.9 mg, or 39 percent of the DV, of manganese. Puetro Ricans eat a variety of meats, including beef, chicken, and goat, all of which are high in protein but have varying levels of fat and cholesterol. Goat meat, in fact, is surprisingly high in cholesterol, with half the fat but about 15 percent more cholesterol than a comparably-sized piece of sirloin steak. By virtue of its being an island, however, Puerto Rico has an abundance of fresh seafood, including clams, mussels, oysters, shrimp, cod, marlin, mahi-mahi and red snapper. Most types of seafood are very low in fat and are excellent sources of protein along with nutrients including vitamins B-12 and B-6, iron, copper, zinc, phosphorus, potassium, manganese and selenium, but they can be high in cholesterol. Perhaps Puerto Rico's number one nutritional no-no is the variety of foods known as "frituras." These fried snacks can be made with a variety of meat and vegetable fillings, but the problem lies in the matter of their preparation. As the name implies, frituras are fried snacks. As with any deep-friend foods, these tend to be high in saturated fat and calories, and may, depending on the filling, also be fairly carb-heavy and high in sodium. If you can manage to limit yourself to just one or two on a rare occasion, you should still be able to enjoy these tasty treats, but on a daily basis, you're advised to stick to Puerto Rico's healthier offerings.